We are sooooooooooooooo fiscally irresponsible. I blame the house. If you remember my post on the history of this place you'll know we're not the first ones to be "charmed" into pouring money into the place. Remember poor Mrs. Cable? We laughed the first time we read the abstract, but it's becoming more of a scary reality for us. Last year at this time we saw our financial advisor and he pretty much told us that if we kept on this route we would never retire. "You do want to retire don't you?" was how I think he phrased it. So we have major structural damage to our roof. It needs to be replaced (it's a long story that I don't feel right telling now). So what are we doing? 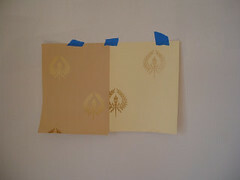 Looking at un-godly expensive wallpaper samples. 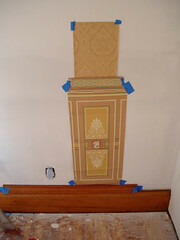 We've always planned on doing Bradbury & Bradbury wallpaper in our foyer. We'd love to do it through out the house, but from what I figure I will have to work approximately 175 hours just to afford the foyer, and that doesn't include the installation fee. No way are we going to mess with this stuff ourselves. So the plan was that we were just going to put a quick coat of paint on for a few years while we recovered from our financial irresponsibility. The only problem is we need to know what color to paint the stairwell. We were never going to attempt to paper that. The 18 ft. Ceiling is just to scary, plus that would add another 50 hours of work to the total. So a few weeks ago Tim ordered samples. Just one problem. He didn't ask me what sample I liked. So you can imagine how ticked I was when the Dresser Tradition 1 Elements showed up. I really don't care for that pattern. Granted I don't dispise it like the Neo-Grec paper, but I really didn't see myself loving it for the rest of my life (yes, we'll pull the old Victorian trick of taking the wallpaper with us if we sell the house, buyer beware!). So I spent a week looking at it, and it just never grew on me. I could tolerate it, but if I'm putting in 175 hours of work I want to be pleased with my purchase. So I got on the web site and found the Neo-classical Roomset. I had requested the Neo-classical catalog about three times from Bradbury and they never send it. We loved the patterns and colors. Granted we both love different colors/patterns, but we think we can work it out. We ordered the Cream set. We had wanted to do something with a little more color, but we also wanted a blue tint in the papers. The surrounding rooms are green and red and we wanted something to break that color block up a little. So Dove was way to colorless, and Jasper and Pompeiian had to much green. The only problem is they papers are sooooooooooo beautiful that we don't want to "wait a few years" to order them. Hmmm, we all no which one is the logical choice, but logic sometimes goes out the window with us old house fanatics. At this point, I’d say it’s even money. B&B makes some fantastic stuff, there’s no doubt about it. However, sometimes it seems like they compress the patterns or something. I’m not sure what it is. 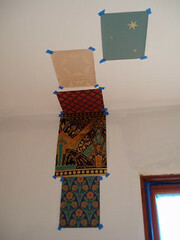 I’ve found about 6 samples of original wallpaper in my house. It is 1895 Victorian wallpaper and only one or 2 of the patterns looks anything close to the eye-popping designs you see on the B&B web site. Maybe The Petch family just had different tastes. I’m not sure what it is. PS I heard B&B was going out of business? Have you heard anything? STOP. Go directly to www.stencil-library.com. DO NOT PASS GO on the wallpaper. The Stencil library has stencils very similar to what you're considering in wallpaper. Bruce Bradbury, when he first started his business, used my in-laws as a way to photograph some of his papers...In fact the "Fenway" collection on the website is their bedroom. Their entire home is covered in B&B paper...and more than 25 years later, it still looks great. I understood that Bruce was going to close his shop, but later found some who would buy the business and carry on...I'm not sure, but I don't think Bruce is involved any more. The wall paper is gorgeous...and I understand the temptation to get to the "fun" stuff first, but I'd try and fight that temptation if you can...(what a party-pooper I am). For us, we have put off doing our yard for nearly six years...tough since I really enjoy a garden. But it was/is the right decision since we would have completely destroyed it in the process of rehabing...not to mention, the money was/is needed on basic functions like, oh say, a roof, electricity, plumbing--you know things like that. The fun stuff, however, is right around the corner--and I'll never have to think about those basic function thingies again. The darker patterns B and B sells are really fun in a small room, and I can understand not wanting that much DARK in a huge space like your foyer. 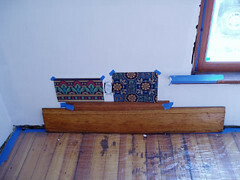 Perhaps a compromise is in order....maybe you can get your fix and do one of the darker patterns in a powder room or butlers pantry or some small closed off space- I did this in my last house's 1st floor 1/2 bath and it was stunning (I did a Fenway dado on the bottom half of the room and painted the wall the same indigo blue and did a gold ceiling. Pay for your baby first! 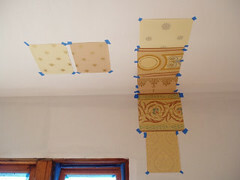 Another alternative to stenciling might be photocopying - no kidding. There was an article in the Old House Journal (last year maybe?) about a couple who consider themselves "serial remodelers" and they made photo quality color copies of a border they liked (i think). I didn't find anything googling, but didn't look very hard. Good luck!